Yeelight RGB Bulb 2nd Generation. 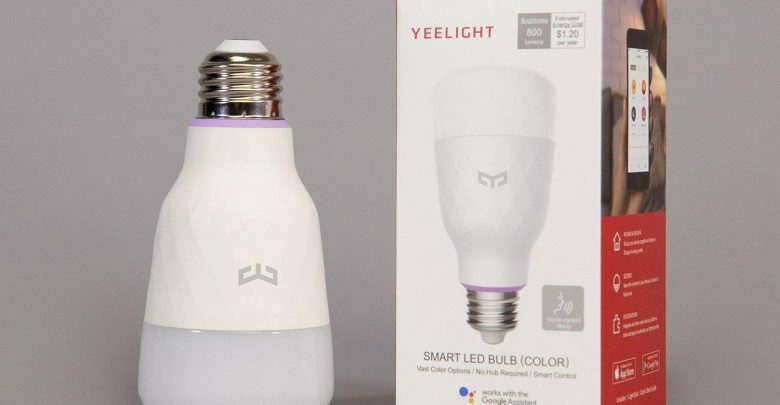 In this Appual’s review, we’ll be taking a look at the 2nd generation Yeelight Smart LED bulb (RGB version), and also the Yeelight Smart RGB strip. There are many Yeelight products available, and it can be confusing which to buy – the 2nd generation RGB bulbs have the product code YLDP04YL, and have a white base, as pictured below. The first-generation bulbs have the product code YLDP02YL, and have a silver base. 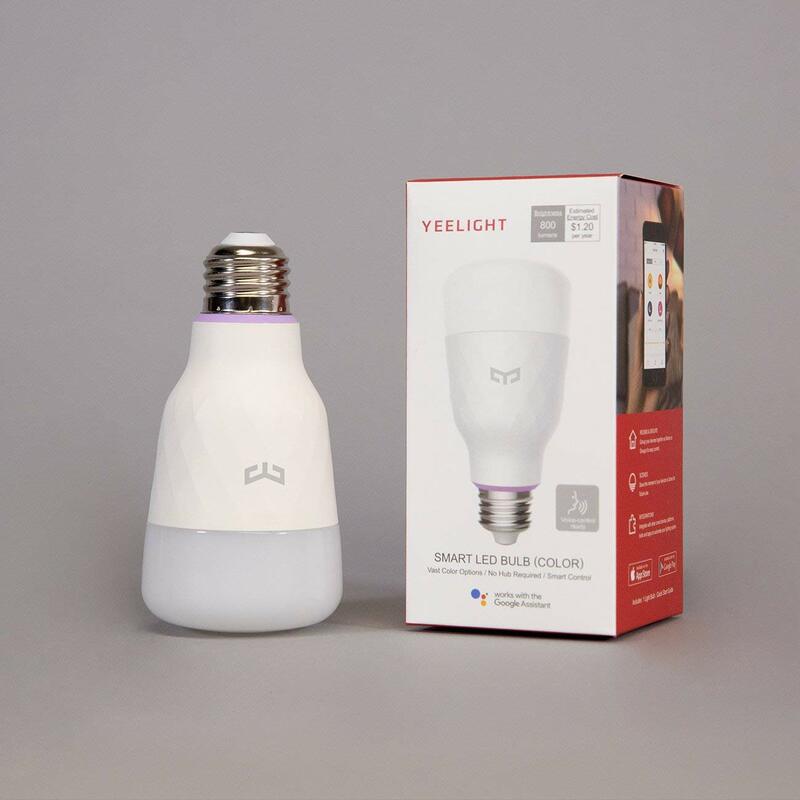 There is also the Yeelight Blue II bulbs, which operate by Bluetooth instead of WiFi. Hopefully this clears up any confusion, as I almost purchased Yeelight Blue II bulbs, thinking they were 2nd generation WiFi bulbs (because of the “II” in the name – I realize now “Blue II” is a play on “Bluetooth”). Both the RGB bulbs and the RGB strip support 16 million colors, brightness dimming, and also 1700k to 6500k color temperature. They connect via WiFi to your home router or mobile hotspot – though setting them up with a mobile hotspot is a bit tricky. Once you connect the bulbs to a socket base and turn them on, you need to download the official Yeelight app for either Android or iOS, and add the lights to the app – this means that your phone and lights need to be on the same WiFi network. 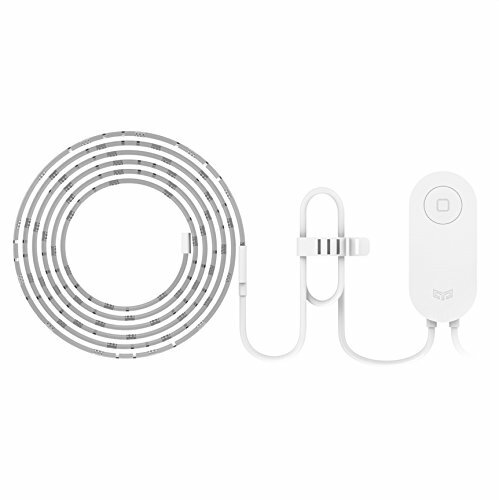 I do not own a home WiFi router, I use my Android phone’s mobile hotspot for internet connection on my computer – so adding the lights was a bit tricky, but I figured out a solution (see Appual’s guide “How to Connect Xiaomi Yeelight Devices to Android Without a Home Router”). In any case, once I connected the lights and strip (I purchased 2 RGB bulbs and 1 RGB strip) to the Yeelight app, I played around for a bit with the various Scene presets. Scenes are ambient “moods” built into the Yeelight app, and there’s quite a few of them – “Romance” scene for example will make your lights slowly hum between pink and red, whereas the “Movie” scene turns your lights a cool blue shade. 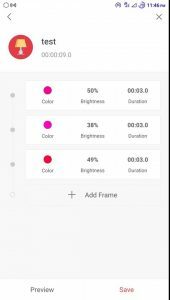 The Yeelight app also allows you to group lights together, or apply colors / scenes to individual lights. There’s also a Customization menu, where you can create your own scenes and presets by adding “steps” and timers. There’s a “Music Mode” in the Mi Home app, which flashes your lights in different colors depending on the music you’re playing on your phone, but this Music Mode isn’t in the official Yeelight app, which is kind of odd. So you need to also download the Mi Home app if you want Music Mode, although there are some third-party Yeelight apps that have a Music Mode as well. You can also control the lights through various integrated apps, such as Google Home, IFTT, Amazon Alexa, etc, though I didn’t get that deep into it. You can connect your Yeelight account to Google Home, for example, and then you can say “Okay Google, turn off my lights” into the Google Assistant app. 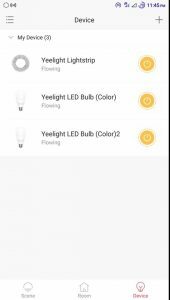 Personally, turning the lights on and off and changing the colors through the Yeelight app is good enough for me. Using third-party integrations just becomes a spiderweb of different apps all connected together (add your Xiaomi ID to Yeti, Amazon Alexa, Google Home, etc.) which feels like a hassle – that has nothing to do with Yeelight, its just the way things are with all these Smart home apps. You end up with like 8 different apps to perform different tasks. The RGB bulbs aren’t very bright – they’re definitely more for ambient lighting, rather than lighting your entire room (unless you buy a bunch of them). They have a maximum brightness of 800 lumens at 10 watts energy rating, so maybe 2 or 3 bulbs could be enough for a smaller bedroom, on the brightest setting. They’re also have a lifetime expectancy of 22 years, if you use them for 3 hours a day. I’m using mine around 15 hours a day, so we’ll see how long they last. As for color display, they’re actually really good – the colors are bright and vivid, and transitions are smooth. There was a very slight “flickering” issue in previous firmware when a high command rate is sent to the bulbs (e.g. 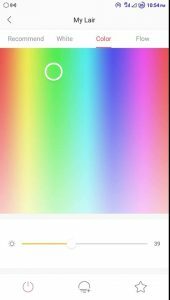 telling the bulbs to change colors at a rate faster than 300ms), though a beta firmware update has solved it, and should be rolled out to the public in the near future. 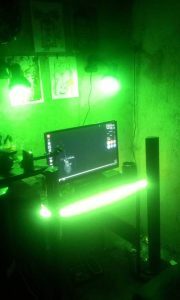 As for the RGB strip, it is also a great product – at 2 meters (6.5 feet) long, it was more than enough to be wrapped around my computer desk, and it has its own on / off switch pad. The only issue was the sticky adhesive used on the strip – it was very weak, so I had to use Mighty Bond glue to stick the strip on my surface. 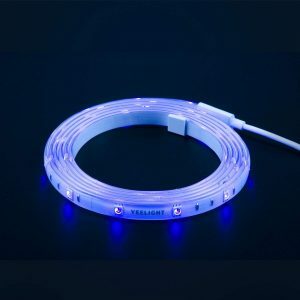 If you want an RGB strip longer than 2m, Yeelight also just recently launched their Yeelight Aurora Lightstrip Plus series, which is extendable and the maximum length is 10 meters, though they aren’t available yet on Amazon. One other drawback of the RGB strip is that it is not a multicolour display, meaning the strip can only display one colour at a time. This is to be expected though, as programmable, multicolored RGB strips are typically a bit more expensive. People rave about Philips Hue and LIFX bulbs, which are much more expensive than Yeelight. Because Yeelights are only about $25 per RGB bulb, I wasn’t expecting much from them, but my expectations were far exceeded. This isn’t exactly surprising though, as Xiaomi (who owns Yeelight) is well known for creating premium products at very competitive prices. I put together some videos of the Yeelights being used with the Jeelight for PC app (that isn’t a typo). 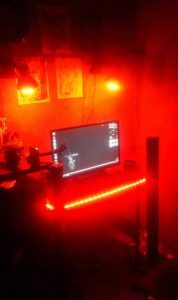 Jeelight is a third-party software which allows you to control the Yeelights from your PC, and has a ton of additional features, such as an Ambilight mode which changes your Yeelight colors depending on your screen content. This is actually a really awesome effect for watching movies or playing games, so I’ve put together some videos to show you my Yeelight setup, with Jeelight in action. Watching a (horror) movie with dark scenes. Watching a music concert with lots of flashing stage lights. Playing Skyrim and Slitherio on PC. As you can see, Jeelight did an awesome job of syncing my Yeelights to what was happening on my screen, adding a lot of immersion to whatever I was watching or playing. 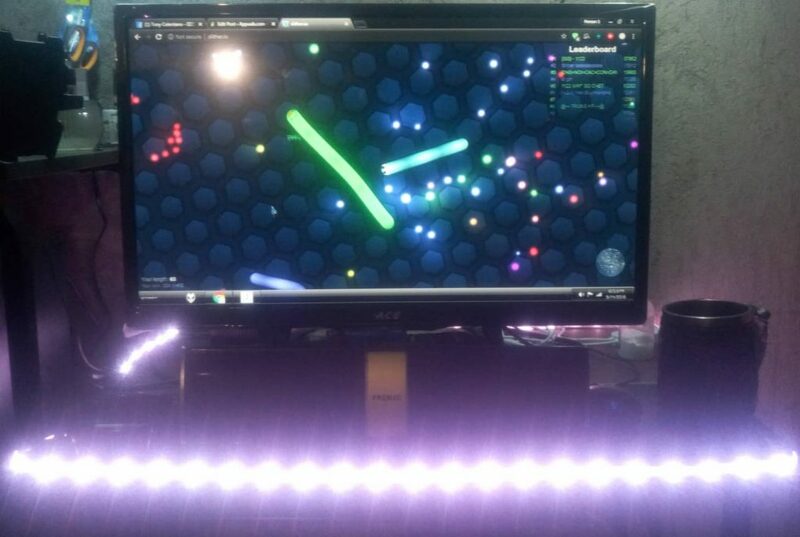 Games like Slither.io and Hole-IO were particularly cool using “Mouse Flow” in Jeelight, as the lights would change color depending what my mouse was hovering over – the bright, multicolored pellets in Slitherio, for example. If you’re in the market for Smart lighting, but don’t want to spend $200+ on a basic Philips Hue starter package, you should definitely give Yeelights a try. I’ll repeat myself that they should not be used as your primary lighting, unless Yeelight releases some bulbs higher than 800 lumens. 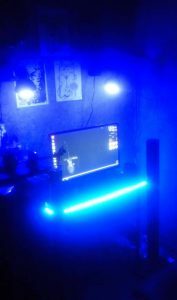 For ambient lighting and adding some “mood” scenery to a room, or using them in combination with Jeelight app for watching movies and playing computer games, they’re definitely worth the purchase. A Philips Hue starter kit will run you about $200 and require an additional hub, whereas Yeelights are about $25, connect to your WiFi and they’re good to go. 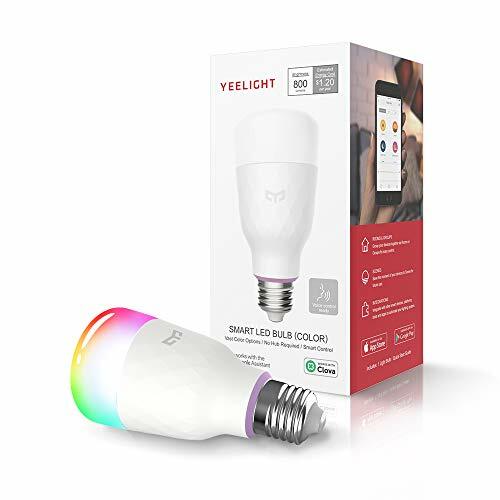 The Yeelight RGB V2 bulb is for 110-120 VAC, and will definitely blow immediately if connected to a 220V without any kind of power down-stepper. Also, they are E27 socket base – while many people claim that E27 is directly compatible with E26 and vice versa, this is not entirely true. The threading can be off just a tiny bit, which can lead to loss of contact – your best bet would be a socket base adapter, if your socket bases are anything else beside E27, including E26. As for the RGB strip, it works from 100V to 240V, and uses a 12V 1A power supply.